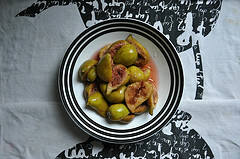 Remove the stems from the figs. Wash them. Put them in a casserole and cover them with wine. Cover and bring to a boil. Reduce heat and gently boil for about 30 minutes until all the moisture from the wine is absorbed. Stir them and add spices. Keep stirring until the flavor from the spices is incorporated. It is elegant to serve them as an appetizer.